In a city that tends to cherish the young and new, the term "Classic L.A." seems like an oxymoron. But even though Chasen&apos;s is long gone, there are a few establishments that have withstood the test of time, and played a role in our cultural history by serving dishes that have grown to define us. Here are eleven of our favorite classic—and quintessentially L.A.—dishes from across the city. Bay Cities is a great example of the most common kind of tale in Los Angeles, the tale of those who move west to reinvent themselves. The original founder, Antoni DiTommasi, was a Chicago policeman. 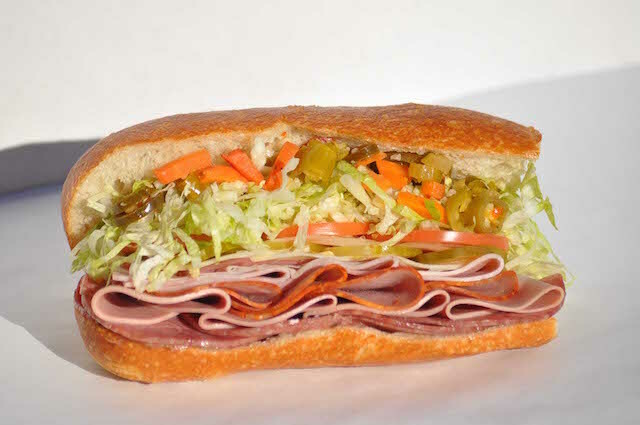 Rumor has it, after some trouble with the Chicago mafia and a gentle nudging to leave town, he packed his bags, moved to Los Angeles, and opened up a deli in 1925. Ninety years later, it still serves Santa Monica. The famous sandwich, The Godmother, entered the scene in the 1950&apos;s. Prosciutto, ham, capicola, mortadella, Genoa salami and provolone cheese. Order with "the works," and hot or mild peppers. Sure you can get it to go, although it really is best eaten there. Matsuhisa on La Cienega, opened in 1987, is the spark that lit the flame for Nobu Matsuhisa, the chef and owner of a now worldwide brand. He started his career in Peru, and developed innovative dishes that blended together Japanese and Peruvian styles of cooking. 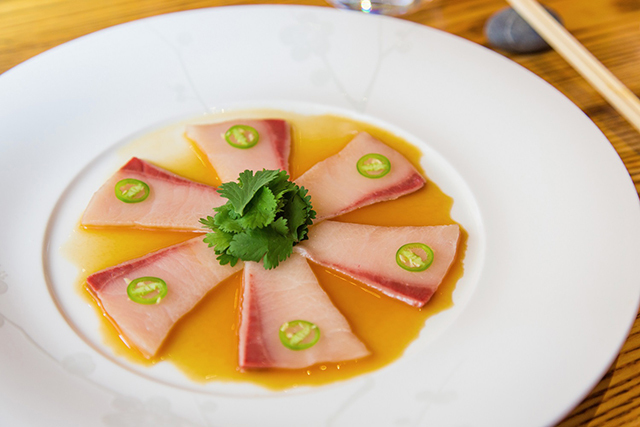 Yellowtail jalapeño, a sashimi dish that incorporated a then-bizarre twist (the jalapeño as a spice), became a trademark dish for Nobu, and not only perpetuated the brand but also crossed over to influence most Los Angeles sushi restaurants. The Musso & Frank Grill is among the elders on the list, open since 1919. As told by Peter Landroche, the maître d of Musso & Frank (and previously of Orso), Charlie Chaplin and Rudolph Valentino would regularly meet at Musso & Frank for lunch, since it was equidistant from their two studios. One would ring up the other and speak a single word into the phone: "Musso." The last person to make it to the table had to pick up the tab. They preferred the booth by the front door, so they could tie up their borrowed studio horses outside and keep an eye on them through the window. The booth is still nicknamed "Charlie Chaplin&apos;s booth." 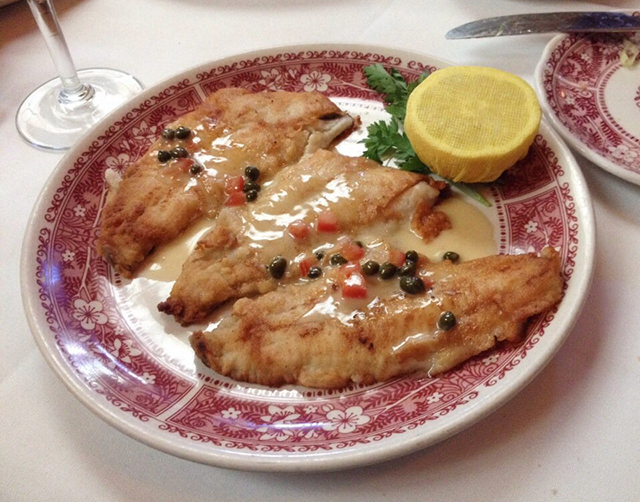 Although many of the dishes could be considered classic, and the original menu is hanging on the wall at the back of the restaurant, one of the favorites is the filet of sanddabs, a white fish served with a lemon sauce. Though their popularity has waned in recent years, sanddabs were long considered an iconic California fish ("in the days of Chandler and Hammett," a former L.A. Times food critic once wrote, "and dabs ranked right behind halibut as the most popular flatfish"). Musso&apos;s old school filet is light enough to order a side of creamed spinach with it, an order of asparagus with hollandaise sauce, plus a side of sautéed mushrooms and maybe some french fries. 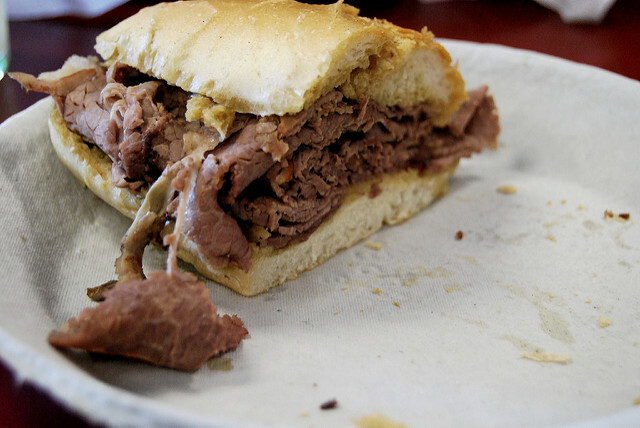 In 2002, my aunt, Nora Ephron, wrote an article in The New Yorker, awarding Langer&apos;s the trophy of "the finest hot pastrami sandwich in the world." For a Los Angeles institution to have beaten out New York, in The New Yorker, by the ultimate "New Yorker," was no small feat. Langer&apos;s gets its pastrami from distributor RC Provisions, a relationship that began with the late Al Langer, who founded the deli in 1947, and Bill Giamela, the now-75-year old founder of RC Provisions. The tradition of hand-selecting the cuts was perfected by their fathers and passed down to sons Norm Langer (Langer&apos;s) and Matt Giamela (RC Provisions). This method of hand selection is apparent in the pastrami&apos;s flavor. 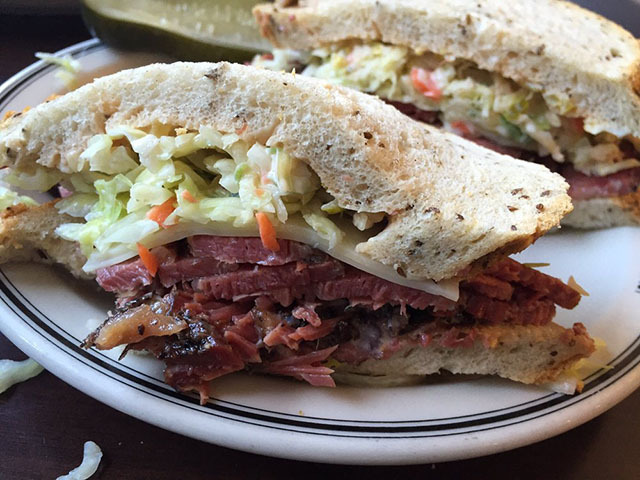 While the #19 is the classic, and includes cole slaw, Russian dressing and swiss cheese, there are traditionalists that believe the pastrami is so good it only needs mustard and the rye bread. Founded in 1947 and still owned by the same family, The Apple Pan has been featured in not one, but two Huell Howser specials. He refers to it as a "survivor," a restaurant able to "hold out... [but] not sold out." Made up of one long counter with red stools (with backs! ), they serve soda in paper cones and ketchup on thin paper plates. 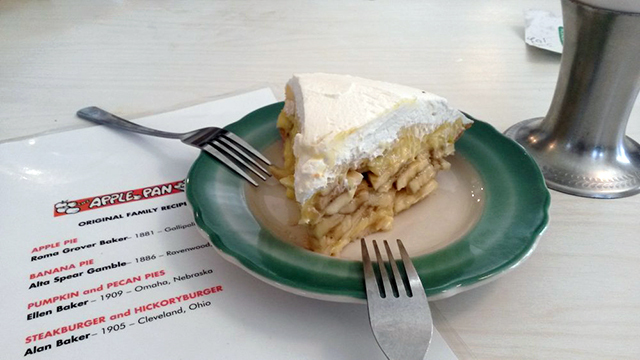 Their classic dish: the banana cream pie. But you should probably order a hickory burger or a tuna sandwich before the pie so you haven&apos;t only had a massive slice of pie for lunch. A lobster in a Hawaiian shirt waves at you from PCH, beckoning you into the parking lot. If you want to work up an appetite, park in the back of the lot and take a walk up the Corral Canyon trail. But don&apos;t do the entire loop or by the time you make it back down the hill, the line will be too long and the tables too full. It is very important to get a table in the first section of the three-tiered outdoor picnic table seating so you can have an optimal view of the ocean—prime seating for possible dolphin and whale watching. 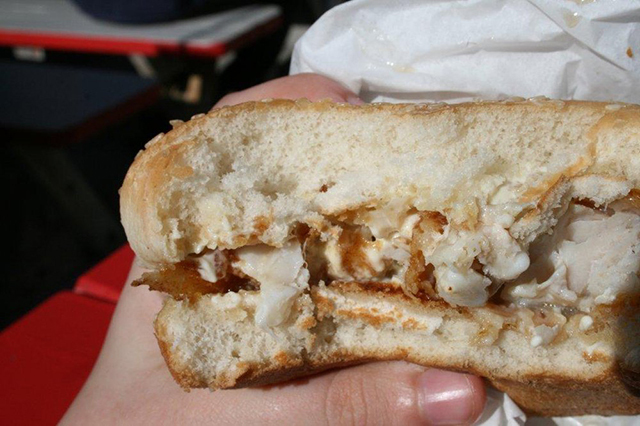 Order a fried fish sandwich without the cheese, french fries (there&apos;s malt vinegar on every table), and a Juice Squeeze. Founded in 1972, Malibu Seafood preserves the youthful nostalgic feeling that one should not need to wear shoes in Malibu. Long before The Grove was built, The Farmer&apos;s Market stood on its own as a fixture of Los Angeles "cool." It was the main hang-out for the characters in the Weetzie Bat series. 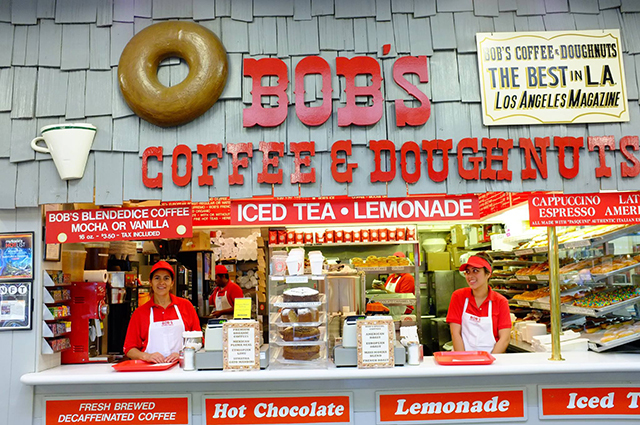 With the add-on of The Grove, the original spirit of the eclectically hip Farmer&apos;s Market seems a distant memory, but right in the center, still serving Los Angeles with the grace of its simplicity, is Bob&apos;s Coffee and Doughnuts. The gourmet doughnut is currently trending throughout the city, but Bob&apos;s has always captured a quality that seems to elude its new competitors: that when you bite into their doughnuts they dissolve quickly in your mouth, an airy-like dough perfected over the years since owner Bob Tusquellas bought the place in 1970. Bob&apos;s Coffee & Doughnuts is located at 6333 W. 3rd St. (#450) in the Original Farmer&apos;s Market. Located on the ornate streets of Chinatown, surrounded by other local Chinese eateries and burgeoning art galleries, is a classic American Chinese restaurant with big round tables and a wall lined with photos of seemingly random celebrities. 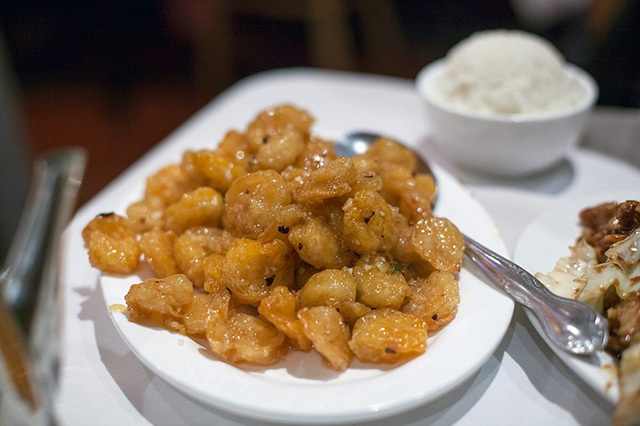 There are now three Yang Chow&apos;s in Los Angeles, but this family-run downtown original opened its doors in 1977, and helped make slippery shrimp, a lightly fried and delicious sweet shrimp dish, popular all over the city. According to a 1991 L.A. Times article, they give out the recipe on request. Located in Eagle Rock, and serving regulars that have been coming from all over since 1955, is Casa Bianca: a Sicilian, red-checkered tablecloth, cash-only joint. It&apos;s the kind of place where the waiters are proud to work there. In fact, one waiter, Brianne Newton, told me it took her three years to get the job and has had it for the past 11. Her enthusiasm about the place was infectious, and a warmth permeates the truly "family-style" restaurant. Order a side of meatballs with your pizza, and if you bring enough family or friends to help you polish it all off, order appetizer dishes of bruschetta and garlic bread. Philippe the Original is located at 1001 N. Alameda St. in Chinatown. A Boyle Heights institution not far from the Hollenbeck police station, El Tepeyac has been a go-to spot for Mexican fare since 1955. 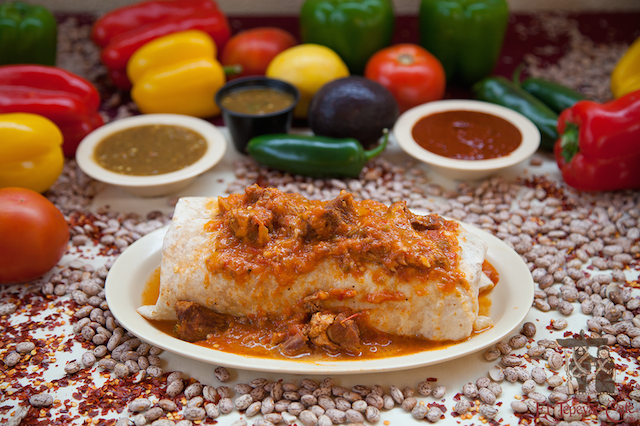 One of their signature burritos is called The Hollenbeck, named after the policemen who kept requesting additional ingredients until the burritos (packed with seared pork meat, rice, beans, guacamole and more) grew to weigh an average of five pounds each. Owner Manuel Rojas used to give shots of tequila to his patrons as they entered. Rojas passed in 2013, the shots are gone but the charm still remains. Anna Harari is a Los Angeles-based writer-director-producer.